I proclaim it Dinosaur week here on “Let Other Pens.” Dinosaurs keep popping up…pinterest, at work, on the clothing of my baby roommate. 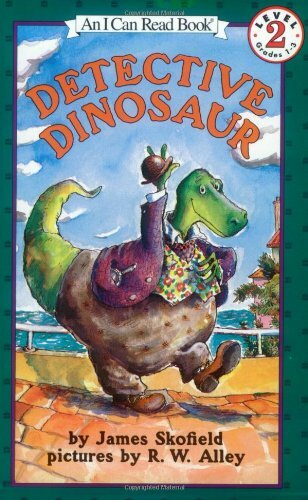 Hence…Dino week and to kick the week off…a dinosaur booklist! 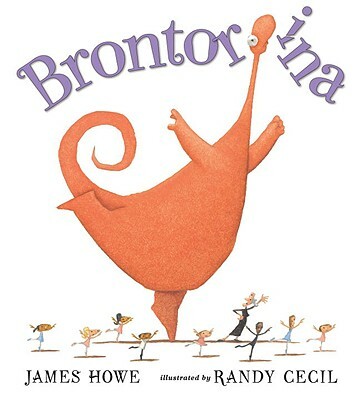 “Brontorina” by James Howe – Brontorina has always wanted to be a ballerina, but no ballet slippers will fit her feet and she is too tall to fit into the dance studio. 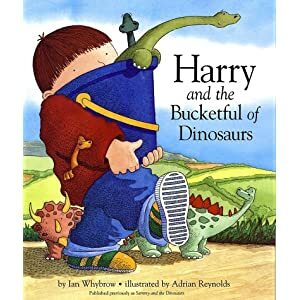 “Harry and the Bucketful of Dinosaurs” by Ian Whybrow – While cleaning in the attic, Harry finds a bucketful of dinosaurs. Each dino comes alive as Harry learns their name. “How do Dinosaurs Eat Their Food” by Jane Yolen and Mark Teague – Do dinosaurs have good manners or bad? Do the fidget and squirm or do they eat their food nicely? Read this book to find out! “If the Dinosaurs Came Back” by Bernard Most – If the dinosaurs came back, think what great helpers they would be. Everyone would have a ride, dentists would have plenty of work, and they would make great pets!! “The Super Hungry Dinosaur” by Martin Waddell – The super hungry dinosaur wants to eat Hal and his little dog Billy, but not that won’t happen if Hal has anything to say about it. “Vacation’s Over: Return of the Dinosaurs” by Joe Kulka – The dinosaurs have been in space for millions of years, but now they are back and nothing is as the left it. “When Dinosaurs Came With Everything” by Elise Broach – One day while running Friday errands with his mom, a little boy realizes all the shops are giving away a dinosaur with every purchase. Buy a dozen doughnuts, get a dinosaur…and not just a toy, but a real-life dino. “Detective Dinosaur” by James Skofield – Detective Dinosaur and Officer Pterodactyl solve cases together including the mysteries of the missing hat, the squeaky show and the loud clanging noise. “Dinosaurs before Dark” by Mary Pope Osborne – In the first book of the popular Magic Treehouse series, meet siblings Jack and Annie as they find a magical treehouse that can travel in time. This time they are going to visit the dinosaurs! “The Dinosaur Mystery” by Gertrude Chandler Warner – The Boxcar Children are helping at the Natural History Museum, but something mysterious is going on, plus someone keeps sabotaging their work in the dinosaur display. Used to make my grandma read it all the time. There’s also a copy of it on my bookshelf in the living room, right next to Anne of Green Gables. That is funny…I left it off the list, because I remember not liking it as a kid. I don’t remember why, just that I didn’t like it. Danny and the Dinosaur was a favorite of mine!! !